Appeltern is a difficult place to describe. Basically, it's a permanent exhibition park for show gardens which, as of 2009, featured an astounding 190 individual model gardens. Exhibitors range from large suppliers in the horticultural and construction trades, to smaller landscape firms, to individual designers. At first glance, the concept sounds amazing. I was picturing a permanent Chelsea Flower Show, with more gardens, more designers, and real-life, walk-through gardens. Sadly, while there are some interesting and worthwhile things at Appeltern, overall it just doesn’t work. At the end of the visit, I was left with the awful feeling that I don’t want to see another model garden for as long as I live. Let’s start with the good things about Appeltern. This may seem superficial, but I was completely blown away by the maintenance of the whole place. I’m not sure whose responsibility this is, but every garden was impeccable. All the plantings were full and lush with not a single diseased plant or weed in sight (maybe this should be worrisome). In the formal areas, everything was perfectly clipped, while in the natural areas, there was just the right balance of contained wilderness. Some gardens were really worthwhile, especially in the Architects Gardens (Architectentuinen) area. They were creative and managed to rise above the crowd, which is pretty impressive in a crowd this size. 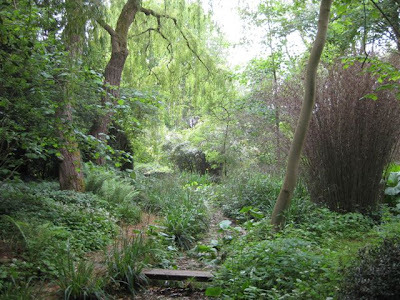 One of these was the garden by Ton ter Linden (below). We walked into the garden, not knowing the designer, and immediately loved it. 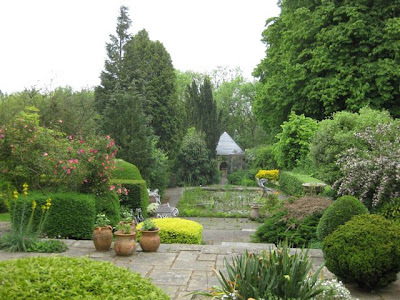 It got me thinking about how good gardens are instantly recognizable, and what sets these gardens apart from the rest? Now to the bad part. It’s difficult to put a finger on what exactly is wrong at Appeltern. As I think the pictures show, there are many good things here (all the pictures are of the 'good' stuff), and in fact none of the gardens were obviously ‘bad’. However, at their core, it seemed to me that the majority of gardens suffered from an unshakable feeling of fakeness (sorry, that’s the best term I can come up with). Clearly, the gardens are ‘fake’ because of the very premise of the park. Most other art forms, such as paintings or sculpture, are easy to exhibit. Garden exhibition, however, is a tricky thing, and a garden must be that much better to succeed in such a setting. It’s certainly possible, but unfortunately most gardens at Appeltern don’t manage to achieve this. In many gardens, the ‘fake’ element was obvious – anything with a perfectly set ‘entertainment’ area or a built-in barbeque (the whole ‘outdoor living room’ concept) automatically falls into this category for me. Disappointingly, even many of the gardens with no specific tacky elements felt that way. The gardens that tried to break out of the mold by offering something new and creative seemed like they were just copying the latest trends. But perhaps the biggest downfall of Appeltern, ironically advertised as its biggest attraction, is the sheer size of the place. At 13 hectares (32 acres), it took us a few hours at a brisk pace to get through it. At the end, we were completely gardened out. Nobody can enjoy and absorb this many gardens. Gardens are supposed to be unique and magical, not 190 in a row. Overall, I wish I could erase my experience at Appeltern. It has tainted my view of show gardens by reducing them to mass-produced, assembly line commodities (of which gardens are supposed to be the exact antithesis!). Gardens are meant to inspire a feeling, to evoke an emotional response. As a place that is supposed to be a source of education for the gardener, I suppose Appeltern teaches us that great gardens can’t be achieved simply through nice paving, some plants, and the latest outdoor decoration. 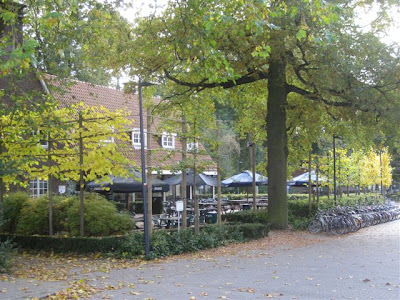 The third garden we visited during our trip to the Netherlands was the Priona Garden, designed by Henk Gerritsen together with the late Anton Schlepers. 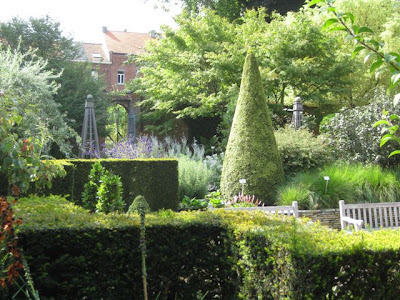 This garden is closely connected with the gardens of Mien Ruys and Piet Oudolf, the other two famous Dutch gardens we saw on our trip. Together, I found that this beautiful trio perfectly illustrates the evolution of Dutch garden philosophy over the last 50 years. The starting point for all is Mien Ruys’ garden philosophy of "wild planting in a strong design", where structure and plants get equal billing. Piet Oudolf builds on Ruys’ concept, but tips the balance in favour of the plantings, with his strong swathes of prairie style plantings and bold perennials and grasses. The Priona Gardens go one step further: Ruys structural foundation is now almost completely obscured by the plantings, which have gone from ‘natural’ to downright wild. 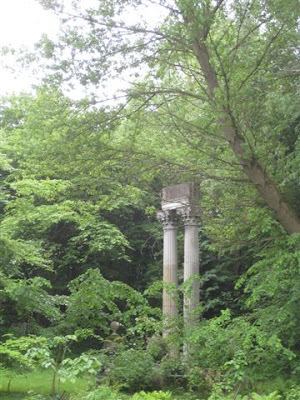 The Priona Gardens blur the line between tended garden and wild area. At first, I was taken aback by just how loose the garden is, just how un-gardened. The feel, at least as I experienced it as a visitor, was that of a very recently abandoned garden. The garden elements are there, it is clearly tended by a human hand, but it’s as if the gardener just happens to be away this season. This is as natural as a garden can possibly get while still retaining some fundamentally recognizable garden features. Some will definitely not like it, but perhaps this is what gardening needs – to push the envelope of what exactly gardening is, a phase many other arts have gone through. Of course, it’s a fine line, and it doesn’t always work. At times, the Priona Gardens are brilliant, while other times you lose the feel of the garden. The pond and patio in the two pictures above were beautiful, as was the weird and wonderful topiary area below. I think both captured the intended feel of the garden exactly. Other areas pushed the garden a little too far into the wild, and the result was only a jumble. Overall, a really interesting garden offering a glimpse of a very different, and thoughtful, garden philosophy. When gardeners plan trips to the Netherlands, one of the main reasons is usually Piet Oudolf’s garden in Hummelo. Given that he is one of the most prominent designers today, it’s no wonder that the gardening masses flock to see what he has created in his own backyard (or actually front yard). Needless to say, I am no different and have been planning a trip there since arriving in Belgium. When I finally found myself on the way to his gardens this past September, my expectations were soaring. But with high expectations also comes the risk of disappointment. What if Oudolf’s garden wasn’t quite as amazing as I was hoping it to be? What if after all the pictures I’d seen and books I’d read, it would just be old news? It’s terrible to be let down by your heroes, and I’m easily disappointed by gardens that I build up too much in my mind. Well, luckily for me and everyone else, Oudolf did not disappoint. In fact, it’s quite amazing that even with all of the preconceived ideas and advance knowledge, his garden still managed to impress. In broad terms, Oudolf’s main theme is the use of grasses and large perennials (especially North American prairie species) in a loose style designed to “inspire a feeling of nature”. It sounds and looks fairly straightforward, but it’s a hard style to replicate, or at least to replicate well. In his design and planting philosophy, he advocates shape, form and texture first, and has proposed that colour is only secondary. Ironically, I found colour to be one of the most stunning elements in the garden. Colour inspires the strongest and most immediate response in humans, and Oudolf does it so well I find it hard to believe it was left to secondary consideration. Of course it’s all in the presentation, so it’s all about how the colour is communicated to the viewer. It’s the texture of the colour, combined with shape and form, which create the stunning overall effect. The main area of his garden, which was redone recently to fully reflect his mature style, is the best of the garden (and it’s where all the pictures are from!). Fully enclosed by hedging, and punctuated by his now trademark curved hedges, it is filled to the brim with grasses and perennials. The impression is that of a continuous sea of planting where you are completely immersed in plants but not oppressed by them – it’s a floating feeling rather than a sheltered one. Oudolf has described being strongly impressed by the North American prairie, where in late summer you can be fully surrounded by swaying perennials and grasses towering above your head. I think this is recognizable in his garden, which manages to evoke a similar sensation even if the scale is much smaller. In addition to this main garden space and the garden leading into it from the old house (with some diagonal design elements, lawn and hedging), there is the nursery maintained by his wife Anja. If I had a garden in Belgium, restraint would have been impossible, especially because the prices seemed very reasonable. Unfortunately, given our current apartment situation, I was just left salivating. Even here, without any planned design, the mix of plants is still beautiful. I suppose it’s another testament to Oudolf’s philosophy - when the form and texture of the plants is right, the overall results will be pleasing. To follow up on the pruning blog, I couldn’t leave the topic without talking about pleaching. I have rarely seen this in Canada, but is it ever popular here in Belgium! It seems to be everywhere, from residential to institutional landscaping. I haven’t always had my camera on hand to take pictures, so we’ll have to make do with the few I do have. Pleaching is the training of trees to form a horizontal framework above the ground. Basically, the effect is that of a hedge on stilts. 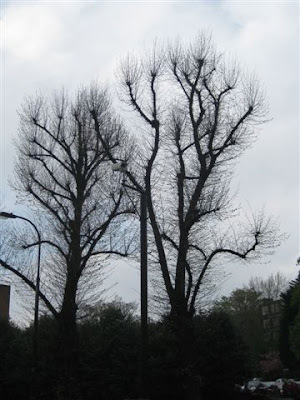 Pleaching is not exactly straightforward: the right type and size of trees have to be chosen for the job, a sturdy framework built, and every year the trees have to be pruned and trained along the framework. Not only is it a lot of work, but it can also take a bit of time before the desired effect is achieved. No wonder then that it never caught on in North America. However, it's still very popular in Europe, perhaps because here it is grounded in a long tradition of use. Since medieval times, pleached trees have played an important role in gardens, mainly to create walkways or enclose spaces such as kitchen gardens. Pleaching is a very architectural feature, which allows for an interesting space division at a higher level than a hedge. By using plants to create this division, the feeling is lighter and less overpowering than enclosures created with hardscaping. It’s a great way to raise the garden up and define 3-dimensional space on a comfortable, human scale. As with any garden design tool, there are many good ways of using it, and just as many bad. 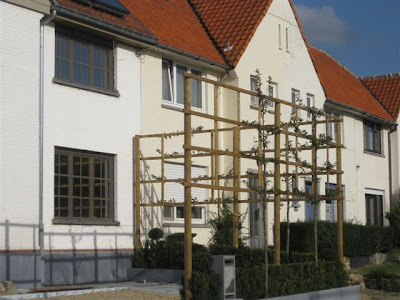 Here in Belgium, I've mostly seen it used to create privacy in front yards where a high wall would obviously be impractical. I think the look works well here because it's used with either older buildings or very modern ones. In between, one might have to be careful so that it doesn't look out of place. Here’s an example that I watched being put up just this summer (it's on my way to work). The trees are so thin at this point they’re barely visible. It'll be interesting to see how long it takes before it actually looks like something. This one has probably been in place for a few years and is growing well. This example in a front yard looks like it’s in need of a trim. 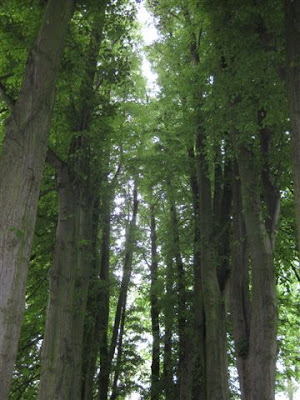 As shown here, pleached trees are often combined with a hedge at ground level. A neat design tool that could offer some interesting opportunities for creative and unconventional use. 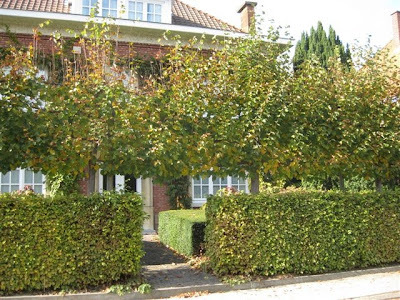 When we moved to Belgium, one local garden practice I was struck by was the pruning. I don’t mean the perfect hedges and little boxwood animals, although there are plenty of those here, but rather big scale pruning of large trees, or pollarding. Pollarding consists of cutting back tree branches either all the way back to the main trunk, or to varying degrees along the main branches (multi-knuckle pollard, high pollard, etc). This treatment is not very popular in North America, but it sure is here. It’s been practiced in Europe for centuries to keep tree sizes in check, control shape or harvest wood. In winter, when deciduous trees are without leaves, it is rather striking. Below is a picture taken in London, Reagent Park area, in early April before leaf budding. Personally, I thought these trees looked like scary monsters subjected to some sort of gruesome experiments, and which will come back to haunt their tormentors at night. I wondered if this does not affect tree health, but apparently it actually increases lifespan by keeping the tree in a juvenile state and reducing top weight. Still, when I saw the tree below in the Leuven Botanical Garden, I couldn’t help feeling a little sorry for it. It almost looks embarrassed by its nakedness – not even some branches to hide behind during winter. 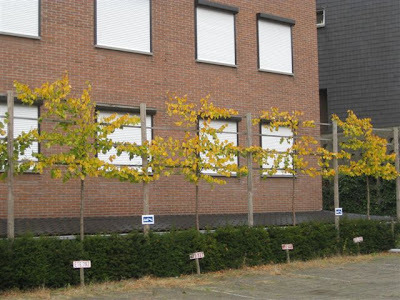 In summer, the trees recover fully – below is the same tree from the Leuven Botanical Garden in summer. It continues to grow throughout the summer, and the canopy now completely covers all the branches in gigantic leaves, a side effect of the pollarding. Hedge pruning is also extremely popular here, and taken very seriously. Check out these complex, perfectly pruned designs in front of two residential houses, representative of common front yard looks. Back at the Leuven Botanical Garden, this conifer has perplexed me all year. It has been impeccably pruned every single time I have visited, which is quite often. When does it ever grow??? A lesson in pruning dedication. Over the past few months, I’ve been incredibly lucky to have the chance to visit some fantastic gardens around Europe. They’ve all been amazing, and I’ve learned something from each of them. But growing nice plants and organizing them together in a pleasing way is one thing; creating a garden space that leaves visitors saying “OMG, this is BRILLIANT” at every corner, is a little harder. And that’s exactly what happened when we visited Mien Ruys’ garden in the Netherlands a few weeks ago. I am in complete awe and admiration of Mien Ruys - her garden was a revelation. First, a little bit about Mien Ruys. I feel very ignorant for not knowing much about her before. Her parents owned a popular perennials nursery, and wanted to add design services to their business. At the age of 19, Mien was put in charge of the new design department since she was more interested in how to use plants rather than how to grow them. Training in landscape design was virtually non-existent at the time, so she studied architecture, and picked up practical training in England. 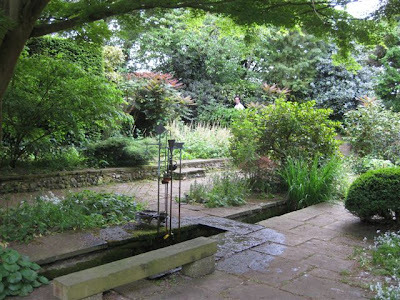 Over the next years, she designed many private gardens as well as public, communal projects. Her projects were mainly in the Netherlands where she’s quite well known, but it seems that she never achieved the same level of fame internationally, which is a real pity. 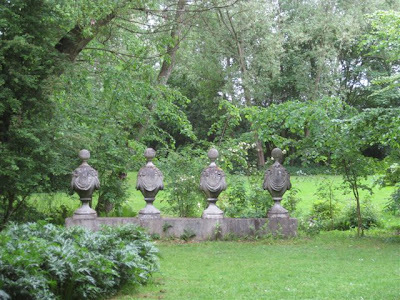 The Mien Ruys garden is the best that remains of her work. It’s actually her parents’ nursery, which was Mien’s experimental laboratory. The property spans her development over her entire career, from the late 1920’s to the 1990’s. In total, there are 28 separate garden spaces, each of which represents an experiment with a different idea or approach. It’s a unique garden experience to walk through these spaces, each offering a different lesson in garden design. I’ve included pictures from a few of my favorite ‘rooms’, but it would be too much to talk about each one of them here. However, while each space is unique, there were a few consistent themes that struck me (but this is only personal analysis, not sure what the experts have to say about her designs). Simplicity. There is nothing convoluted or over-the-top in any of the designs. They’re not trying too hard – every element feels right, every element belongs. This is probably the hardest thing to achieve in design – a feeling of inevitability, like this is the only right design for that space, nothing more and nothing less. Definition of space. Every 3 dimensional space is brilliantly used and defined. The garden rooms aren’t separate, abstract spaces, but they form part of the whole and make use of existing natural features, views or enclosures, and level changes. One ‘garden’ is a perfect circle set in the middle of a small wood on one side of the property. Here, Mien wanted to create a garden in the forest with minimal impact. By only removing a few trees, she created a perfect circle planted only in monochromatic green groundcover. The effect is that of a porthole in the forest with a cathedral-like feeling. Simple and stunning. Innovation. I was completely amazed by the originality displayed in all of the designs. All the spaces would hold up perfectly well as modern gardens today, and some were created almost 80 years ago! Mien was the first to use railway sleepers in her designs (which I’ve seen in soooo many garden design books now), and exposed aggregated pavers (again, so often seen and copied). In one garden, a square space is planted only in asters. A few other purple plants and grasses poke up through the soft green carpet of asters, as seen below at the time of our visit. But imagine this garden when the soft green cloud of asters will be completely covered in vivid purple bloom – it will be absolutely stunning! The garden has enough to keep it interesting all year round, and then in the fall it will be an unforgettable sight. A completely original use of the plant, which just goes to show the endless possibilities for creativity that garden design allows. Balance. I found that all the gardens had a fantastic balance of ‘hard’ landscape elements (like paths, fences, patios etc), and plants. Too often, garden designs are either one or the other. They’re both equally important, and each enhances the other. Mien’s unique perspective, which combines architectural training with an intimate knowledge of plants from her parents’ nursery and an obvious artistic touch, is key in her designs. Overall, this is a garden that should be right at top of the list for both pleasure and educational visits. Mien Ruys is my new garden design hero. This whole garden is like walking through an amazing, living, garden design textbook - imagine seeing all those exercises from design class, like laying out a garden using squares or perfect rectangles only, changing space with diagonals, and many of more things actually put into practice perfectly! It’s a garden for which you’ll need a long time to absorb and properly digest all the lessons it has to offer. It's amazing how easily we forget that the plants we grow in our gardens originated in the wild, and that they're still growing there now. I'm always surprised to find a common garden plant growing in nature, even though of course I shouldn't be. When we went to Dijon in May we took some walks around the hilly countryside which was chock full of plants we are used to seeing in our gardens. Cranesbill (hardy Geranium) covered many open meadows and was spectacular in full bloom. It was also neat to see hellebores, considered pretty 'fancy' in the gardening world, growing casually in the forest. Unfortunately, I can only write about these as I've lost all of our Dijon pictures in an unfortunate incident involving our laptop and beer. I do, however, have a bunch of other pictures that I've been taking since spring of beautiful wildflowers from around Belgium and France. In early spring, the season started with these little white beauties covering the ground next to the driveway leading to our CSA. A few short weeks later the same spot was full of blue Campanula, grasses and a dark-stemmed, dark-leaved artemisia. Also in the spring time, I spotted these yellow irises blooming by the side of the canal in the middle of the city (the water looks a little brown...). Not sure if these would be native or spread here from a garden? Although we saw some nice wildflowers in Belgium, the most stunning vegetation was in the French Alps. I have tons of wildflower pictures, not all of which turned out so well, but here are a few. These are stunningly blue lupins blooming only in mid-July because of the high altitude. The plant diversity of the hillside meadows was absolutely amazing! And the colour combinations! These giant verbascums lower in the valley were perfect with the tan seedheads of the grass. I also loved this plant - unfortunately, I'm terrible with wild plant names, so I have no idea what this was. Back in the Lowlands, we visited the Netherlands two weeks ago and went to the National Park the Hoge Veluwe. An amazing park with savanna-like woodland, open grass plains, sand dunes, and heathland. It was my first time seeing some of these sandy habitats and my favourite was the heathland, which was working up to full bloom. Every habitat is an incredible source of unique and unexpected wildflowers - keep an eye out for them and you'll be surprised what you find! The last garden we visited on our trip to the UK in May (yes, I’m a little behind!) was the Gibberd Garden. Sir Frederik Gibberd was an architect and landscape designer who started his practice in the 30’s and was quite influential in his time. One of his major projects was as chief architect planner for Harlow New Town, a new development not far from London designed to relieve congestion in the city. He himself decided to live in Harlow, and this where he spent the rest of his life, which in large part was devoted to his garden. On its website, the garden is described as: “No high brow horticulture here. It is landscape as theatre” (Hugh Johnson). And that’s exactly what it feels like – dramatic, staged and expressive. But don’t imagine a glitzy theatre production – it reminded me more of a show that has settled into a long run, with the stage set a little run down and worn away, and the actors aging into their roles. Not that it’s a bad thing. It suits the garden perfectly, and in fact seems to be necessary to create the special atmosphere of this garden. The touch of wilderness and crumbling stone add the romance and mood that make this kind of garden great. 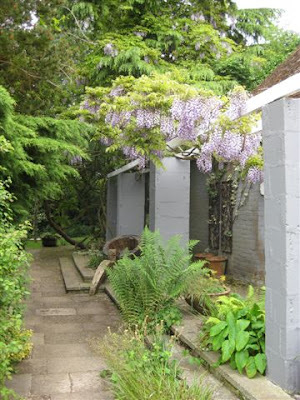 The garden is quite large and covers a sloping site with mature trees leading down to a brook. The design radiates out from the house, with the formal areas closer to the house giving way to more informal and wild areas at the far edge of the property. One complaint I have is the organization of the direction of the visit. Following the provided map, you start from the wild areas and make your way back to the house. It’s always nicer to experience a garden the way the designer intended, which in this case, and most cases, is starting from the house. Around the house, the design is geometrical, in keeping with the 1960’s design of the house itself. One can tell that views from the large windows were carefully considered – there is a staged view from each of the main sides of the house, including this lovely view from the main windows. The other sides of the house have views that are just as interesting, such as this small corner with a great water feature and sculpture off the west side. The design concept of the garden is that of garden ‘rooms’, where one passes from one enclosed and unique space to another. Sir Gibberd approached garden design from an architectural perspective, so definition of three-dimensional space was key to him. As you move away from the main area of the house, a series of garden rooms feature include simple lawns and hedges, a pavilion, pools and many staged areas for sculptures. The garden features over 50 sculptures, which can sometimes overwhelm in a garden. In this case, I found that they were all well placed and in harmony with the garden rather than in competition with it. The rooms are a little bit disjointed so you never quite know what to expect. For example, there is an alleyway of huge plane trees smack dab in the middle of the garden, which, unlike any other alleyway I have ever seen, doesn’t align with any major features or views. Unconventional, but definitely theatrical. By the time you get to the furthest area from the house close to the brook, things are quite wild. There is giant bamboo, small winding paths and jungle-like growth. After the super manicured gardens we saw earlier in our trip at Glen Chantry and Beth Chatto, this had a wonderful untamed character. Overall, I found the garden to be original and unique. Really great gardens have their own special mood and provide visitors with a distinctive experience. In this garden, you can definitely feel the strong design perspective, but also a quirky, playful and eccentric character.